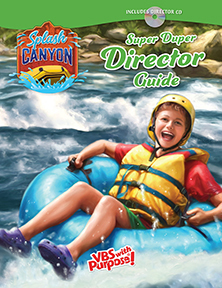 VBS is a wild ride but our Super Duper Director Guide and reproducible CD will steer you in the right direction with tools and tips to guide you around every bend. This is your go-to planning manual for every aspect of your VBS. The inluded planning calendar, budget worksheet, and checklists help benchmark your progress and focus your resources, time, and energy on your VBS ministry. Closing celebration ideas, and much more! Included in the Starter Kit.